Towering palms, bold swaths of color, and tropical plants have transformed the Chicago Botanic Garden into an exotic paradise this year for Brazil in the Garden. To create the “Brazil effect,” floriculturist Tim Pollak and Andrew Bunting, the Garden’s assistant director and director of plant collections, drew from designs by renowned Brazilian landscape architect Roberto Burle Marx, who was known for his bold, modernist style. 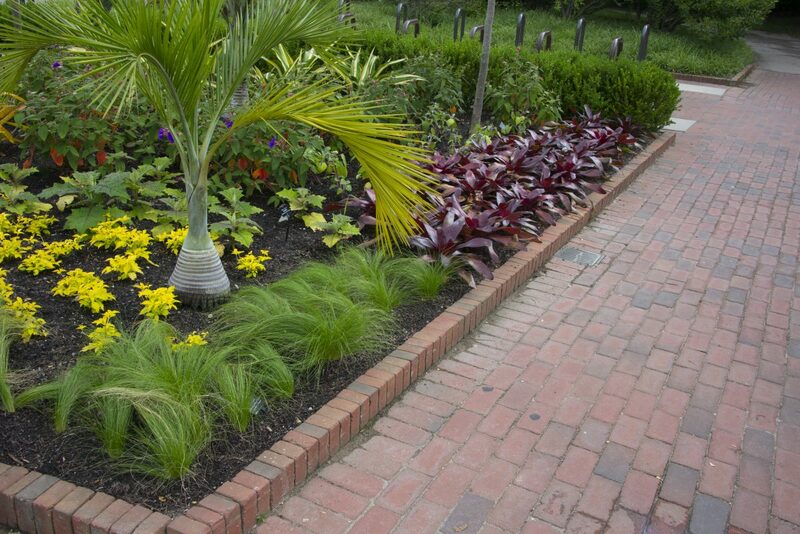 We talked with Pollak and Bunting to learn how you can grow a Brazil-inspired tropical garden. Burle Marx used bold, bright colors such as purple, orange, and green in his gardens. When planting your garden, Pollak recommended choosing foliage plants with various shades of green. Foliage tones are endless: silvers, blues, bronze, and burgundy. Foliage plants can also bring out the colors of flowers, and vice versa. For instance, if your garden’s foliage is silver, blue, and purple, pops of white flowers will enhance the foliage colors. “Remember,” Pollak said, “there are no rules when it comes to color.” Complementary or monochromatic schemes are subject to taste. But gardens can still be attractive without flowers. Instead, think of flowers as icing on the cake. 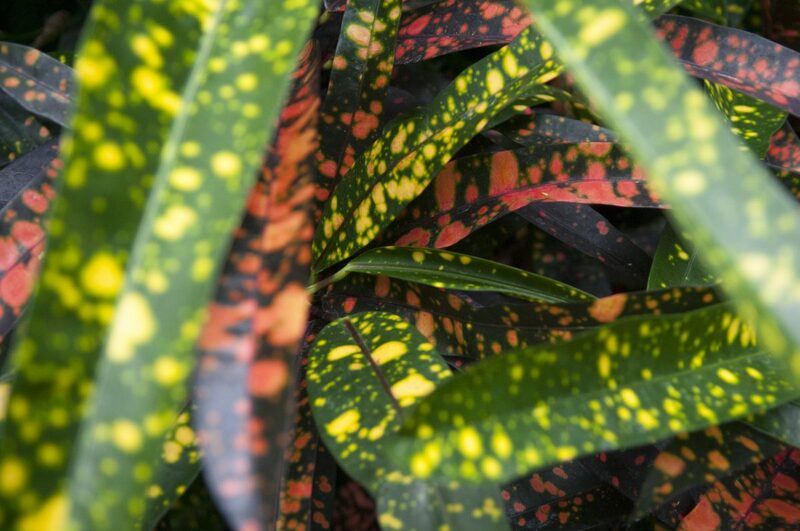 The bright, speckled foliage of Codiaeum variegatum var. pictum ‘Pie Crust’ provides a host of contrasting color all in one plant. Burle Marx was known for using large swaths of contrasting textures and forms in his landscape designs. Get the Burle Marx effect by choosing plants with various surfaces and shapes. 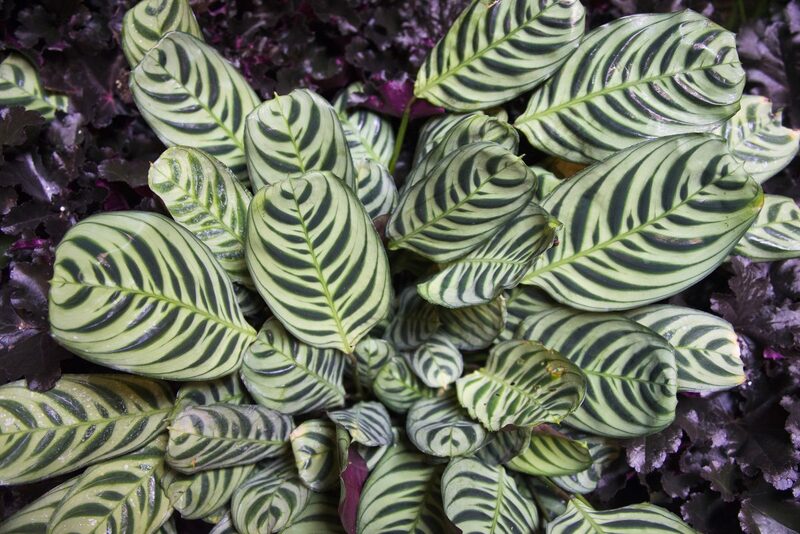 For instance, Pollak said to think about the foliage of your plant—is it shiny or muted? Waxy or fuzzy? Is the venation (patterns of veins on the leaf) netted or in parallel lines? Are the shapes of the leaves long and thin, or short and wide? When shopping at your local garden center or nursery, follow Pollak’s trick: Lay your plants next to each other on your cart or on the floor. 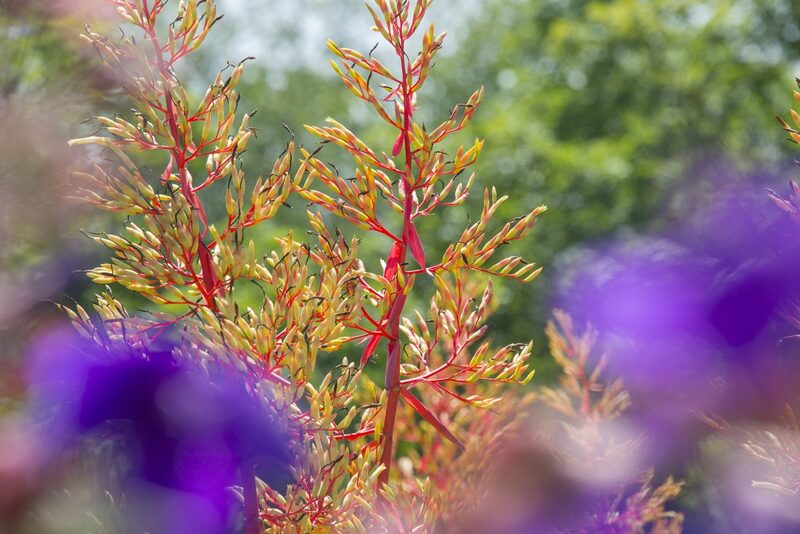 You’ll see which plants have different styles, which create a lush, biodiverse mood in your garden. In the Crescent Garden, Bismarck fan palms (Bismarckia nobilis) and canna (Canna × generalis ‘Orange Punch’) create “thrillers.” The spectacular foliage of Grecian urn plant (Quesnalia marmota) and bromeliad Neoregelia ‘Sunkiss’ fill in the planting (“fillers”). Mexican bluebell (Ruellia brittoniana ‘Purple Showers’) and Purple Heart spiderwort (Tradescantia pallida ‘Purple Heart’) create the “spillers” in the grouping. When arriving at the Garden’s Visitor Center, you might imagine you’ve landed in Miami. Rows of swaying coconut palms, towers of bromeliads, and beds of elephant ears greet visitors as they walk through the Garden. The tropical illusion is deliberate: We repeated similar plants in our beds to broaden the Garden’s designs, making small spaces look larger. In your own garden, you can use swaths of similar plants in rows or curving shapes. 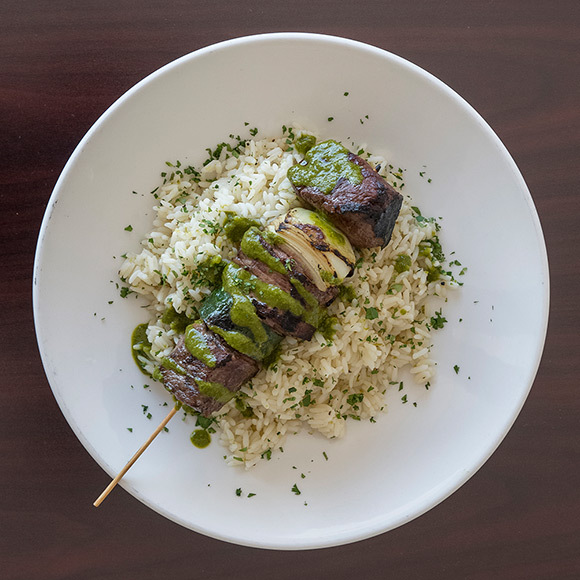 The result may transport you to the tropics. Repetition for effect: planting areas with a single plant create an effect of making an area seem larger. Golden yellow Duranta erecta ‘Aurea’ is planted around a Buccaneer palm (Pseudophoenix sargentii). Dark Neoregelia ‘Royal Burgundy’ is planted at the front of the bed alongside a grouping of fine-textured Stipa tenuissima feather grass. Behind the palm, a grouping of spiky-leafed Naranjilla contrasts with the fuzzy-leaves of Tibouchina grandifolia. Planting a tropical-themed garden doesn’t require you to use 100 percent tropical plants, said Bunting, but a few plants can have an impact. To create a Brazil-themed garden, do as Burle Marx did: Find plants within your reach. That is, at your local garden center or nursery, find palms or other tropical plants that can be brought inside for the winter. To care for tropical plants, keep in mind they thrive in heat and humidity, and need plenty of moisture. Use supplementary fertilizer to keep them healthy and thriving. And remember, if you want the tropical effect without tropical plants, there are plenty of ways to think creatively by using bold houseplants, annuals, and perennials. 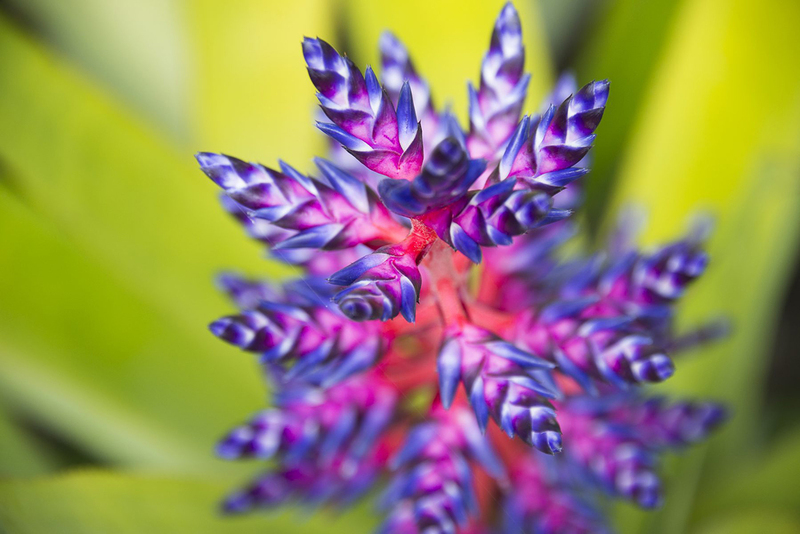 Vase plant (Aechmea ‘Yellow Berries’) adds a perfect touch of the tropics to your summer displays. Learn more about the flora and fauna of Brazil in our upcoming conservation talks, held on the following Thursdays from 2 to 3 p.m. in the Linnaeus Room, Regenstein Center. 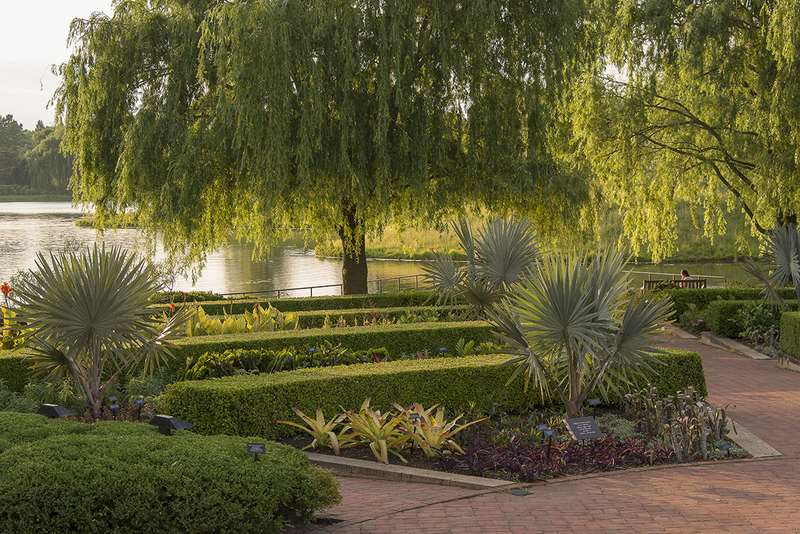 This summer, the Chicago Botanic Garden is transforming—with tall coconut palm trees and other iconic plants of Brazil, inspired by the designs of renowned Brazilian landscape designer Roberto Burle Marx. The making of Brazil in the Garden started with an unlikely source, a family’s brick townhouse in Philadelphia. Two members of the Garden’s design team visited the townhouse last summer, not sure what to expect. What they found was a treasure trove of original work by Burle Marx (1909–94), including stacks of rare, numbered lithographs, rolled tapestries too large to hang, and framed paintings. Some of the pieces, which had never been on public display, are now part of an exclusive Burle Marx exhibition at the Garden. The collection had been in private hands, owned by landscape architect Conrad Hamerman and kept on the third story of his townhouse. When Hamerman died in 2014, his family inherited the pieces. Hamerman was a close friend of Burle Marx, and represented his work in the United States; Burle Marx gave him the pieces as gifts and as payment for his services. Through a contact, the Garden’s exhibition manager Gabriel Hutchison and senior designer Nancy Snyder met with Hamerman’s wife and daughter in Philadelphia to discuss Burle Marx’s artistic legacy and his friendship with Conrad Hamerman. The Garden’s Burle Marx exhibition reveals a rare glimpse of Burle Marx as an artist known for his bold colors, abstract shapes, and modernist style. Hamerman and Burle Marx met as young men in Brazil. Hamerman was a landscape designer who wanted to become an artist, and Burle Marx was an artist who wanted to become a landscape designer. Above all, they were both avid plant people. Their mutual love of plants, art, and design formed the basis of a lasting friendship that inspired them to travel on many expeditions to collect plants together. 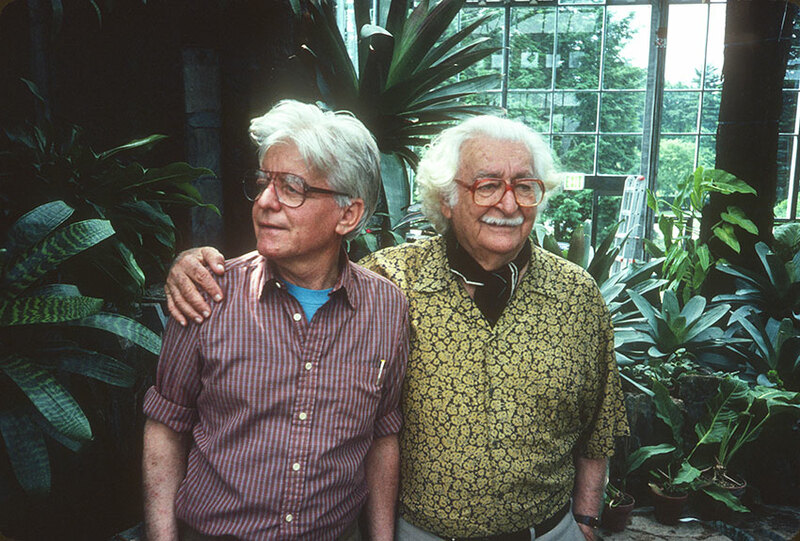 The two even taught university courses together, which is where landscape architect Andrew Durham first encountered Burle Marx’s work. A former student and family friend of Hamerman’s, Durham arranged the loan of pieces from the family’s personal collection for the Garden’s exhibition. The Roberto Burle Marx exhibition runs through September 10, 2017. Though known for revolutionizing tropical landscape design, Burle Marx also worked in other artistic mediums. The paintings and textiles at the Garden exhibition showcase his style of vast swaths of bold hues, cubist influences, and contrasting fabrics. 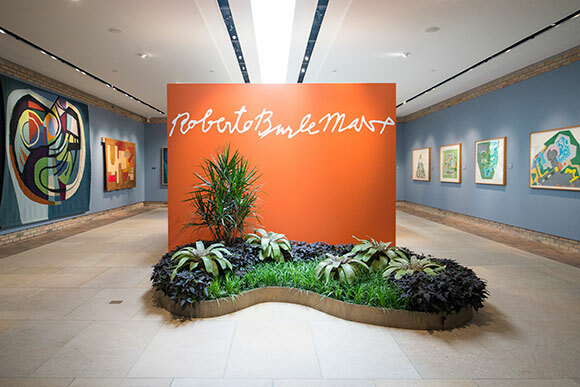 See the Roberto Burle Marx exhibition, open 9 a.m. to 7 p.m. in the Regenstein Center, Joutras Gallery, through September 10, 2017. 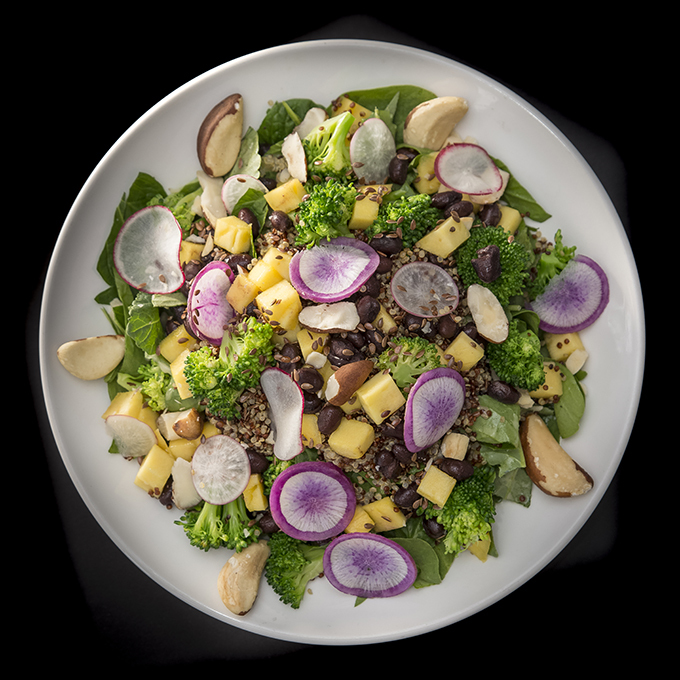 Throughout the Garden, we’re paying tribute to the vibrant spirit of Brazil. Look for samba on the Esplanade, the Brazilian national cocktail in the Garden View Café, cool plants including striking Bismarck palms, and much more. 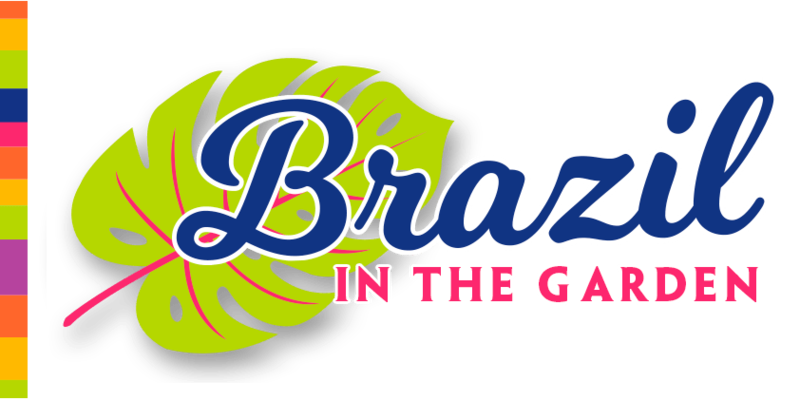 See Brazil in the Garden—throughout the Garden—through October 15, 2017.